Today, February 5, 2018, I cancelled this workshop due to a family emergency. I will teach this course in summer 2019. More information to come. Many thanks to Andrea Wallace, Program Director, and her associates at Anderson Ranch for their understanding. I will be teaching a watercolor workshop at Anderson Ranch Arts Center, June 4 – 8, 2018. A perfect June destination for sure, and the prettiest month of the year in Snowmass. The course is designed for level two students, with previous watercolor experience, this is not a beginner’s workshop. The course is limited to ten students so I advise registering early. This is the only workshop I will be teaching in 2018. I hope some of you can join me. Please let me know if you register. I am pretty excited about returning to teach at Anderson Ranch. Registration opens online January 2 at 9 am, (MT) Mountain Time. This watercolor workshop is inspired by Jan’s ongoing fascination with locally grown produce discovered at farmers’ markets. With an emphasis on healthy and locally sourced food at Anderson Ranch, the course inspiration will be seasonal produce and herbs. Get ready to slice, dice, cut, chop, sketch, and paint. Observe your visits to the market with a new perspective. An onion will never look the same to you again. Capture not only what you see, but also how you react, as you interpret the forms with fluid watercolor. 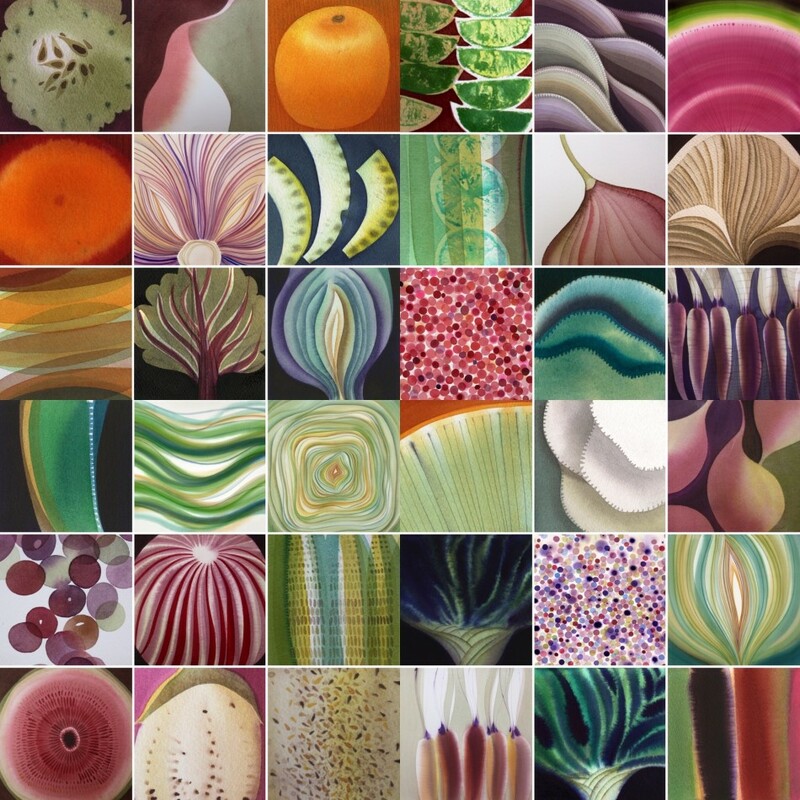 Learn to simplify and abstract subject matter, and record the essence of a fruit or vegetable with minimal marks and a broad spectrum of various techniques. Develop various approaches to the invention of personal color choices and imagery to stretch your preconceived notions of these elements and their initial meaning. Basic techniques will be integrated daily: drawing, painting, technique, color theory, color mixing, design and composition. Demonstrations, one-on-one instruction, and sharing what you have written and painted will provide the foundation for your exploration. This is a level two course and previous watercolor experience is recommended. The workshop is limited to ten students.